Buy now and be enthralled by the captivating story of the site known throughout the Bible as HaMakom, THE PLACE. My aim today is not to focus on me, or on my story; for my story is merely representative of thousands just like it. My aim is to help us reflect and give thanks. The Bible says we ought to give honour where honour is due. Too frequently in our day we find ourselves giving honour to what is not honourable and value to what, in the end is worthless. We have come out today because in our hearts is a desire to give honour where honour is indeed, due. There is not one here who is not beneficiary of what has been done by those we honour. There is not one here who has not in some way, had their life affected by those who've defended us, or those who have fallen in all the deeds and conflicts we pause to remember. I am here by the slimmest of chances, for I can trace, in the War Diaries, the few days in which I was conceived. But my father never saw me. He died, albeit a decorated hero, on 12th January 1943 and I was born 12th May 1943! Edward Alfred Tench embarked on the Queen Mary on February 4, 1941 for the Middle East. He was with 7 Div. Provost Company. After seeing action in Egypt and Lebanon, some of his company was transferred to assist 6th Div. Provost in the huge undertaking of the evacuation from Greece. It was here that Edward Tench distinguished himself by volunteering to undertake a motor cycle journey of some 8 hours duration, (from 0730 hrs to around 1530 hrs) in the Brallos Pass, Lamia, Domokos area to get strategic withdrawal intelligence to the NZ 21 Battalion in the hills in Domokos. The roads he traversed through those 8 hours were under constant aerial bombardment, machine gun and tank gun fire from the rapidly advancing German forces, but he succeeded in his mission and for his efforts was awarded the Military Medal (Military Cross equivalent for non-commissioned ranks). He was soon promoted to Lieutenant. In time the 7 Div. was brought home for re-training and re-deployment to the Pacific theatre where my father was then immersed in the Kokoda campaign. 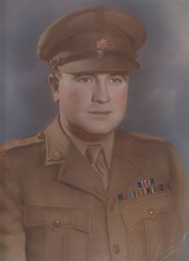 But during that re-training, which took place mostly in Qld, the diaries reveal that my father managed a few days home leave in August 1942, where he performed the necessary duty that got me here, before embarking again from Brisbane on 10 August, 1942, for New Guinea, never to return. He met his death, not at the hands of Japanese fighters, but, as did so many, at the hands of disease – in his case scrub typhus. He is buried, along with almost 4000 others in the Bomana War Cemetery, just out of Port Moresby. As a little boy, my mother showed me his awards and spoke of his bravery – and I was jealous of the other boys who had fathers! When I was 7 my mother re-married, giving me a good father who adopted me, and life went forward. But for me, my biological father was a mythical and un-knowable person. What I didn't know until much later, after my mother had died, was that there was a record that I could access - and when I did, there my father was revealed, sometimes on a day to day basis from the mundane to the heroic! And photos too! Then I discovered that my father was featured in a book about the Provost and through the author I was able to contact some who were still alive. How extraordinary it was, 60 years or more on, to have them remember my father as though they saw him only yesterday - and to sing his praises and regale me with stories of their exploits. (A long story, and I’m giving you a sketch). But, there are thousands of stories like mine, probably some right here today. And for me, as a Christian believer there was a deeper parallel to this. I knew I had a father, but he seemed unknowable, mythical and a mystery - until I discovered that there was a record that disclosed him to me! As I read and researched, I felt I was beginning to know him! A gap was closing. In everyone's deepest place is a sense that we have a Father (capital F) – an Origin, to whom we owe our existence and life and with whom the farthest -in desire is to re-connect. And there is a record of His exploits and His work in our behalf. And the record tells that He had a Son who also laid down His life that others might live and be connected. He's a Father whose heart is broken at the wilfulness that causes us to war and hate and be conflicted, but who desires to heal and restore, but who has said that He can only do it one person at a time, by healing what is wrong in each heart. So, as we remember and as we pause to reflect, there is much for which we can give thanks. To pause is good; to reflect is good. Any reflection on what has been done should soon quench any overblown ideas of entitlement we may entertain! Some of your memories today are of a world that only comes to you in black and white. Some, of more recent conflicts, may be in colour, but however those memories come, can we give thanks for those who left them in our hearts. The epitaph on my father’s grave is from the poem, ‘Hallowed Ground’ by Thomas Campbell. It reads, ‘To live in hearts we leave behind is not to die.’ There is a sense that we too, today, stand on hallowed ground as we pay tribute and honour to whom it is due. Let memories be alive today, but let them lead you, from remorse – to thanksgiving to them – and to God for the legacy we did not earn, yet have inherited and enjoy. ‘Almighty God, we have come out today on purpose. Our purpose is to give honour where honour is due; to pay our deepest respect to those who went through deprivation and loss and pain and even death because they believed there was a cause and a future worth defending. We purposely give thanks to them and for them, and to you, for the blessings we enjoy today because of their willingness. We ask for help and for comfort from the One who Himself became ‘a man of sorrows and acquainted with grief’. We ask for protection from those who would harm and destroy that which they fought or died for. And we ask wisdom and counsel for those who lead us – and for ourselves - to seek your offered peace within our own hearts, so that we allow any war-like attitude within us to be healed by you and brought to resolution. Amen.